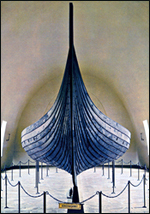 In the Ship Museums of Oslo the Norwegians have on display some of the finest boats that you'll ever see, including three Viking ships of incomparable beauty. Also housed in one of the museums is the Kon Tiki, which, in its own way, is just as beautiful. Standing before this amazing vessel quite takes your breath away, and fills you with admiration for the great explorer and anthropologist Thor Heyerdahl. The raft is composed of 9 two-foot thick Balsa logs, ranging in length from 30 to 45 feet, the longest in the middle, lashed to cross beams, covered by a bamboo deck on which is an open hut. A bipod mast, carrying a square sail, five centreboards, and a steering-oar completed the construction. The reason the Balsa logs did not chafe the rope lashings, was that the surface of logs became soft and spongy, and the ropes were left unharmed as if pressed between cork. The ropes proved to be tough enough to resist the assault of two storms with towering seas. The secret of the safety and seaworthiness of the unprotected Balsa raft, in spite of its negligible freeboard, was primarily its unique ability to rise with any threatening sea, thus riding over the dangerous water masses which would have broken aboard most other small craft. Secondly it was the ingenious wash-through construction which allowed all water to disappear as through a sieve. Neither towering swells nor breaking wind-waves had any chance of getting a grip on the vessel, and the results was a feeling of complete security which no other open or small craft could have offered. Moreover the shallow construction of the raft, and the flexibility allowed by all the independent lashings, made it possible even to land directly on an exposure reef on the windward side of a dangerous archipelago. During the ocean voyage a few experiments were carried out with the centreboards. It was found that the five centreboards, six feet deep and two feet wide, when securely attached, were enough to permit the raft to sail almost at right angles to the wind. It was also ascertained that by raising or lowering the centreboard fore or aft, the raft could be steered without using the steering oar. On this expedition an attempt to tack into the wind failed completely. In 1953 Thor Heyerdahl experimented on a smaller test raft constructed like the Kon Tiki of nine Balsa logs lashed together. He found that a correct interplay between the handling of the sail and the centreboards enabled him to tack against contrary wind, and even to sail back to the exact spot from where he had set off. The centreboard method of steering a raft was astonishing through its simplicity and effectiveness. These experiments proved that the early Peruvian high cultures were very advanced in marine matters, and that an entire reappraisal of early Peruvian seamanship and navigation was necessary. "Hitherto we have only mentioned the construction and the uses they [the raft] are applied to, but the greatest singularity of the floating vessel is that it sails, tacks and works as well in contrary winds as ships with a keel, and makes very little leeway. This advantage it derives from another method of steering than by a rudder, namely, by some boards three or four yards in length, and half a yard in breadth, called guaras, which are placed vertically, both at the head and stern between the main beams. By thrusting some of these deep in the water, and raising others, they bear away, luff up, tack, lay to, and perform all the other motions of a regular ship. The method of steering by these centreboards is so simple, that once a Balsa is put in her proper course, one only has to raise or lower as occasions require, to keep the Balsa in her intended direction." In 1852 Balsa rafts were observed visiting the Galapagos Islands, some 600 miles off the mainland coast. Thor Heyerdahl through his brilliant experiments rediscovered the secret of how the Incas could sail their rafts into the wind, and like all the ingenious inventions the trick was exceedingly simple once it was learned. With sail and centreboard he was able to turn the raft all about and resume a new course into a contrary wind, thus proving for all practical reasons that there is no limits to the range of indigenous Peruvian water craft in the Pacific Ocean, and that no longer can we deny the likelihood that long voyages were undertaken by the coastal Peruvian population.